Print your logo onto these custom printed fidget spinners with gift case or one of our other innovative fidget spinners and use them in your next marketing campaign as a unique giveaway item. These speedy fidget spinners come in fun colours and are the reason for your next addiction as they provide hours of stress relieving fun. YouTube is full of instructional videos how to master the challenge of tossing, transferring and twirling them around. It is a a pleasing sensory experience for everyone - young and old. Do not miss the chance to customize these hottest products here with your logo or message and to reach a huge audience. Furthermore, these ones come nicely presented in a clear gift case which can also be branded. They are CE certified and complie with AS/NZS 8124.1.2016 (Safety of Toys) standard. Colours Spinner: White, Yellow, Orange, Pink, Red, Bright Green, Light Blue, Dark Blue, Purple, Black. Case: Clear. Prices shown include a 1 colour print in 1 position on the spinner. Additional colours or a full colour digital print is also available for an extra cost of AU$ 0.30 per unit. The gift case can be branded with a full colour print and an extra cost of AU$ 0.30 per unit. Spinner: Dia 75mm. Case: L 75mm x W 80mm x 15mm. 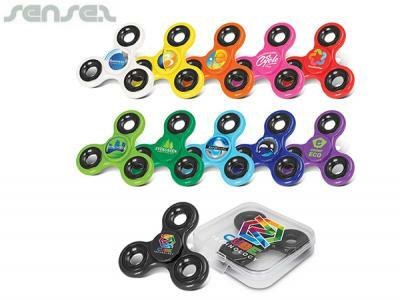 Other innovative corporate gift ideas that could be suitable to create brand awareness include these cheap promotional Cheap Fidget Spinners Classic, quirky advertising gifts such as these Fidget Spinners or how about using one of our more bespoke custom made products such as these great quality LED Blinking Fidget Spinners? Custom brand these carbon steel spinning bottle openers or one of our best-selling promotional games»fidget spinners with your company logo! Personalise your fidget spinners with gift case or custom design fidget spinners for your marketing campaign. How can these unique promotional fidget spinners with gift case or our personalised fidget spinners fit in with your marketing strategy and help you maximise your brand exposure? Our custom made Fidget Spinners With Gift Case can be produced from a minimum quantity of 100 pieces. We can have your logo branded on these corporate Fidget Spinners With Gift Case in Full Colour Digital Print or 1 Colour Pad Print. A setup fee of AU$180.00 will apply to make the film.